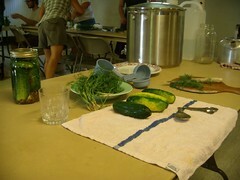 The August 9th introduction to pickling was a ton of fun! Preserving Traditions and Sustainable Michigan met together and presenter Blair Nosan explained the difference between lactofermented and brined vinegar pickles and showed us how to make old-fashioned fermented dill pickles. The choice is yours – you might want to make some of each! When you think of pickles, do you only think of cucumbers soaked in vinegar? While no one denies the joy of a good garlicky dill pickle, there are so many more kinds of pickles to be savored! This class will teach you about the two basic methods of creating pickles: vinegar-brining (for making pickles that will keep all winter) and old-style lactofermentation (which produces outstanding nutrition, but no alcohol). 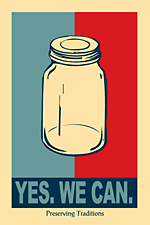 Then we’ll make a quart of lactofermented pickles to take home. We’ll supply salt, dill, and other flavorings. Cost is $5; free for members of the Grange. RSVP here! Cost is $5 (free for members of the Grange). Space is limited!